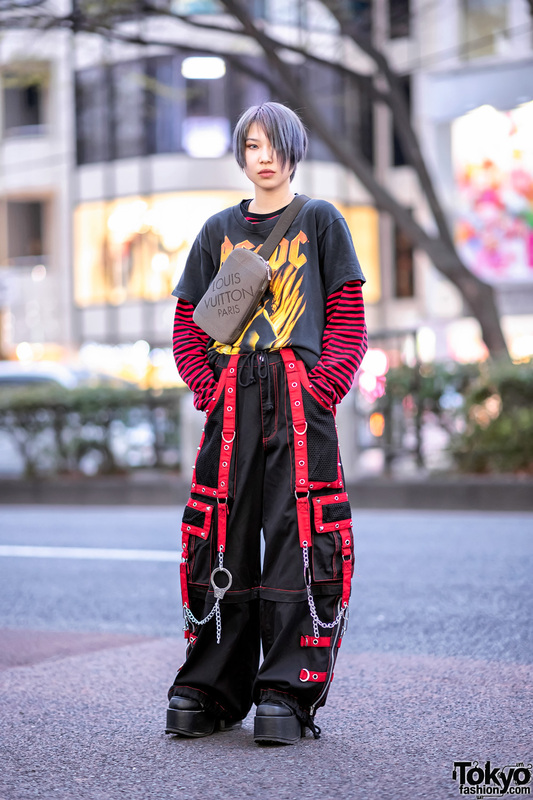 While out on the Harajuku street one evening, we came upon Mawoni and Zutti, students whose colored hairstyles and eye-catching streetwear outfits captured our attention. 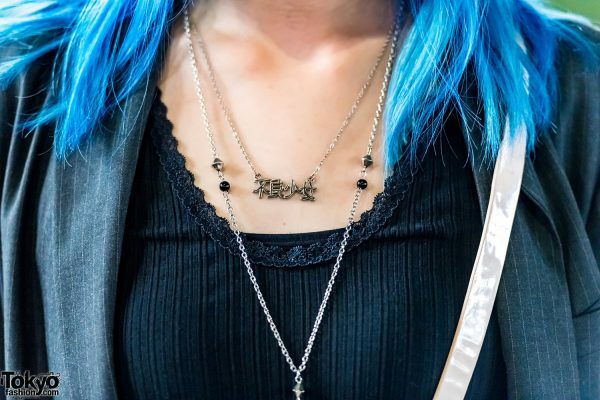 Blue-haired Mawoni is dressed in a black hand-me-down pinstripe blazer, which she styled with a black ribbed tank top and purple faux leather skirt from King Family. She paired her outfit with platform lace-up boots from Yosuke, and a vintage cream boxed sling bag with contrast black lining. The 15-year-old student’s accessories – some bought from Oh Pearl – include clear earrings, layered necklaces, and a white leather grommet belt. Mawoni loves shopping at resale shops, and she likes the music of Puffy. For more on Mawoni, follow her on Twitter and Instagram. 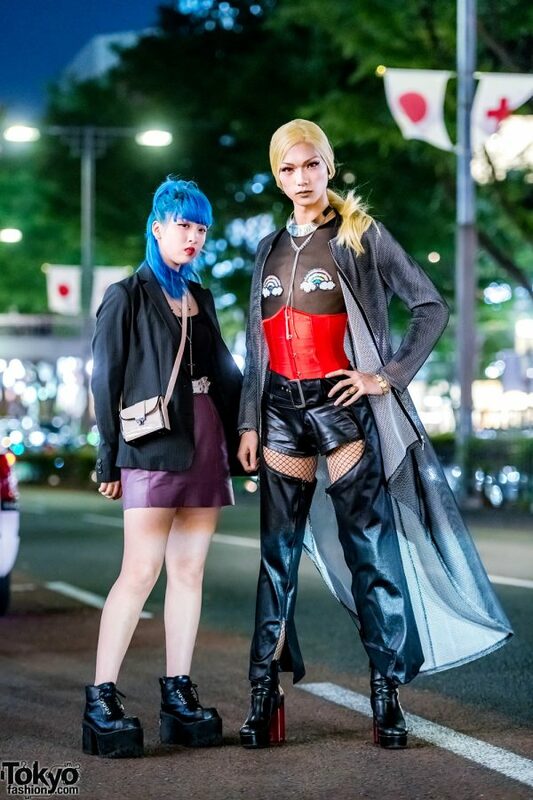 Meanwhile, Zutti – sporting blonde hair and stunning makeup – is clad in a black-and-white long mesh coat from Prega, worn over a handmade black sheer top with rainbow patches on the chest, and layered with a red corset. 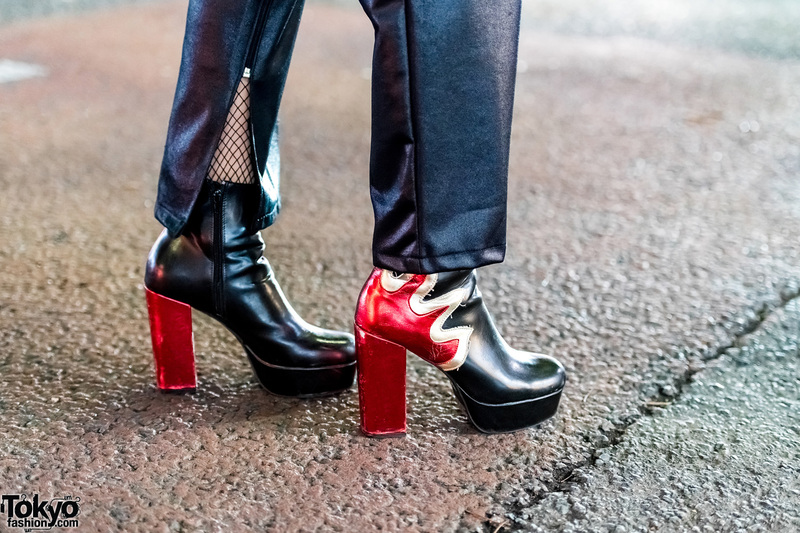 Zutti donned black fishnet tights, Boutique Takenoko belted black leather cut-out pants with zippered inner sides, and black leather colorblocked flame booties from Forever21. The 18-year-old beauty school student accessorized with gold stud earrings, a gold hammered collar necklace layered with a Y-necklace, a gold medallion bracelet, a silver cuff bracelet, and a gold statement ring. 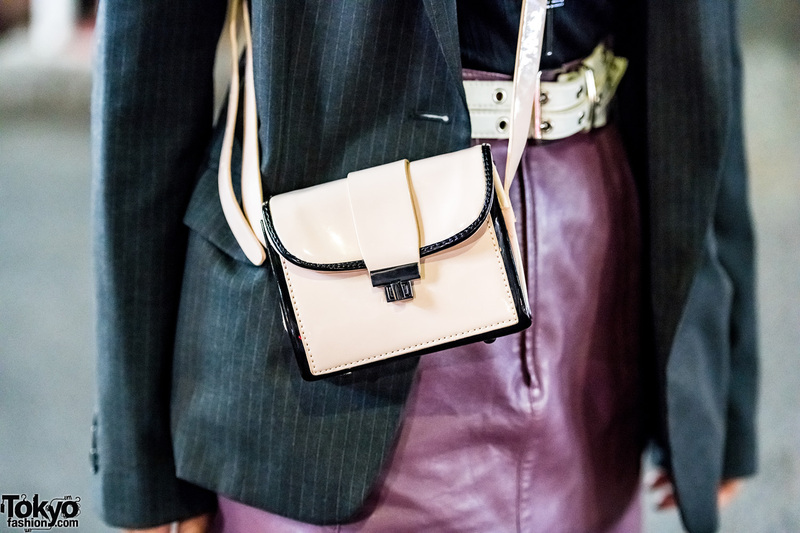 Accessories are sourced from Versace and Forever21. Zutti’s fashion favorite is Versace, and they like the music of Lady Gaga, Beyonce and Nicki Minaj. Zutti is also active on Twitter and Instagram.